The information provided here shows the result of the safety seat with SnugFix Isofix Base installation. This review represents the installation with SnugFix Isofix Base but it can also be installed with seat belt. GRACO SnugFix is a safe and very lightweight safety seat for babies up to 13 kg or 15 months with its 4.1 kg. It can also be used as a carrier and a travel system on all the Graco Classic Connect pushchairs. Side impact protection is maximized with its deep side wings. 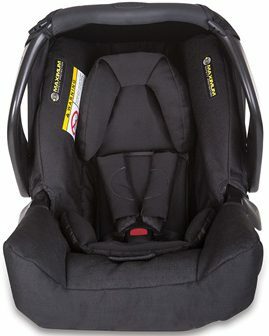 A 5-point harness is the safest way to keep the baby tight and safe in the seat. A newborn insert makes sure that even the smallest ones travel comfortably. You can easily remove the insert from the seat, as your baby grows. The seat is only available in black. I hope you liked this review and if you have any question about the Graco SnugFix seat with SnugFix Isofix Base or want to leave your own personal experience, leave a comment below.